I’ve been doing the gluten-free thing for more than five years now. Which also means that I’ve been baking gluten-free holiday treats for more than five years now. In that time, I’ve had some massive gluten-free holiday baking successes. And, some epically bad baking failures. And, I’ve distilled all that knowledge down into seven tips, just for you. Because what I really want this holiday season is for you to have more wins than fails, every time you get your holiday bake on. 1. Test, test, test. It’s amazing how many great gluten-free recipes are out there. Heck, we have a ton here. But! Be warned that even the best gluten-free recipe may need a little tweaking. Everything from a consistent oven temp to quality or brand of ingredients to the pan you’re baking in to the humidity or altitude can influence your results. So, it’s good to test out a recipe (or, even a couple of recipes in case one is a total dud) before you decide to, like, gift all your friends and family with holiday treats. 2. Look for naturally gluten-free baking recipes. Especially if you’re new to gluten-free baking, search out recipes that are naturally gluten-free instead of gluten-filled recipes that are tweaked to be gluten-free. They usually are winners — and are more straightforward to make. Some good ones to start with? Coconut macaroons, Almond Cake (great for entertaining! ), flourless chocolate cake, or fudge. 4. Pay attention to the type of flour you’re getting. With normal baking there aren’t all that many types of baking flours (cake, white, wheat, etc.). But gluten-free flours? Holy cow there are A LOT. From bean flours to nut and seed flours to coconut flour to the different types of starches/thickeners you can use (xanthan gum, potato starch, etc. ), there are a lot of ingredients to become familiar with. Which can be fun and exciting to explore — but it also means that shopping might take a couple extra trips to find what you need (natural food markets are typically best). It also means you might need to take longer familiarizing yourself with labels. Because Trader Joe’s Ground Just Almond Meal is very different than Bob’s Red Mill Super Fine Blanched Almond Flour (which, by the way, I just got sent and really, really like for sugar cookies and pie crusts!). 5. Weigh your flours. Because all of those different flours are so, well, different, it also means that they measure a little differently than your typical flour with gluten. This is why many gluten-free baking recipes include weights alongside cup measurements for their flours. Instead of measuring with cups, weigh your flours. Yes, this is an extra annoying step, but doing so can be the difference between a really good gluten-free dessert and a total flop. Ask me how I know. 6. Consider all-purpose flour. Does everything I just said about flours make you want to give up on gluten-free holiday baking altogether? Don’t! 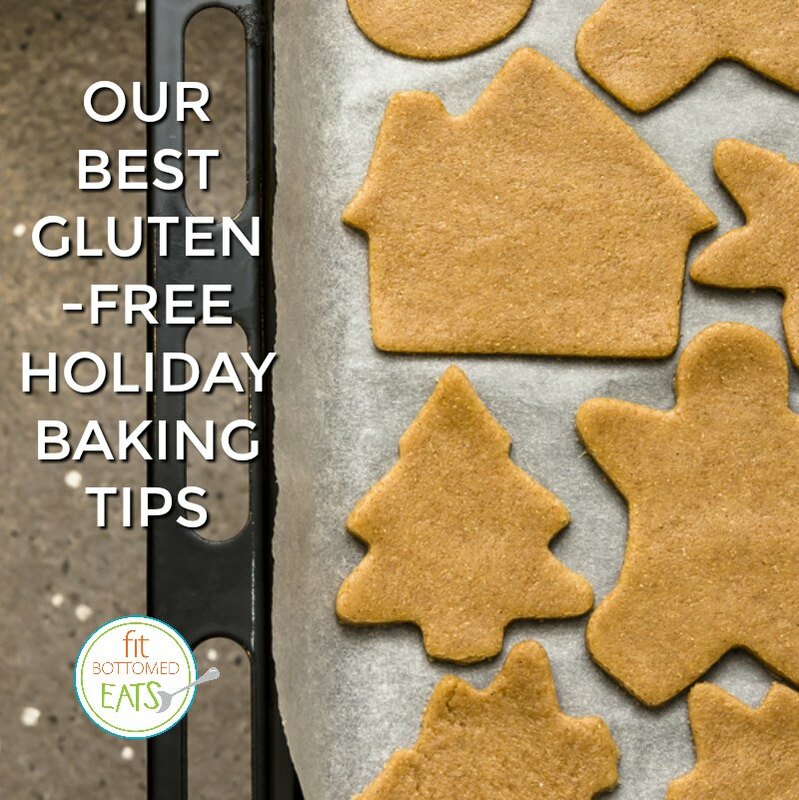 Instead, consider using an all-purpose gluten-free flour (Domata is my fave) to sub in for ANY of your favorite holiday recipes. Or, revisit tip no. 2.